Rup147 is one of the open clusters best suited for testing stellar evolution models and for obtaining precise and detailed chemical abundance information. Chemical composition, distance, age, proper motions were re-derived, allowing us to confirm that Rup147, with an age of about 2.5 Gyr and a distance of 300 pc, is the oldest nearby open cluster known. These results were obtained thanks to the synergy of photometric and astrometric information delivered by the Gaia mission with very high-resolution optical spectra of stars at different evolutionary stages. Left: Teff, log(g) diagram for the 21 stars analysed spectroscopically. Right: CMD for Rup 147 based on Gaia DR2 photometry with the stars fully analysed indicated by light blue filled squares (MS stars) and orange filled diamonds (giants). The stars with high rotation are indicated by pink filled triangles and the binary by a dark green plus symbol; stars considered members (Curtis et al. 2013) and candidate members based on Gaia astrometry and without HARPS/HARPS-N spectra are shown as empty black circles. In both panels PARSEC isochrones are plotted for metallicity Z=0.017, distance 308 pc, and age 2.5 and 3.0 Gyr. 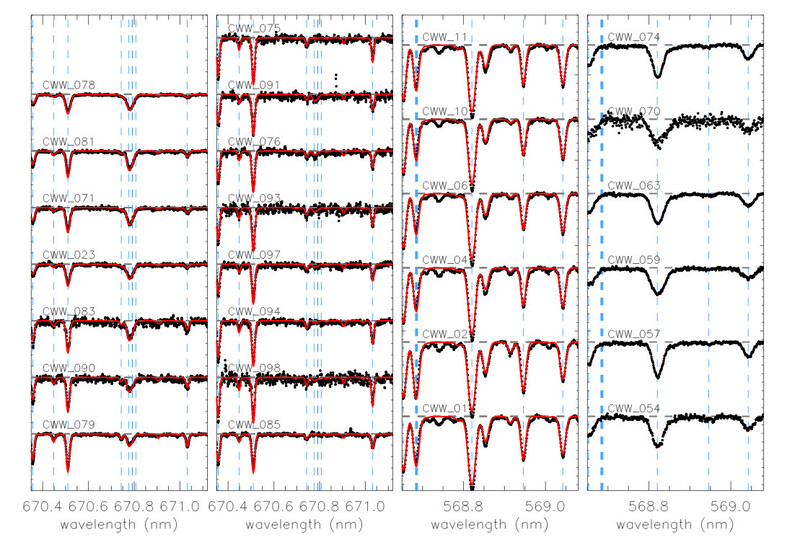 In particular, 6 red giant stars spectra were observed using HARPS-N at the TNG in La Palma (Canary Islands). The spectra of 22 main sequence (MS) stars taken with HARPS at the 3.6m telescope (La Silla, Chile) were extracted from the ESO archive. The stars with radial velocities and proper motions/parallaxes in agreement with the cluster mean values were fully analysed obtaining a final sample of 21 stars (6 giants and 15 Main Sequence). A small spectral region close to the Li I 607.8nm line for our 15 MS sample stars (first and second panels), and the spectral region close to the Na I 568.8nm line for the 6 giant stars observed with HARPS-N (third panel). Also are shown examples of synthetic spectrum fits for the 21 stars analysed, while the 6 stars close to the MSTO excluded from analysis are shown separately (fourth panel). The very high resolution and the large wavelength coverage of the twin instruments (HARPS-N and HARPS) allowed us to derive atmospheric parameters, metallicity, and detailed chemical abundances of 23 species from all nucleosynthetic channels. In particular RV of the stars were measured, atmospheric parameters were determined, and abundances for iron, light-α,iron-peak, and neutron-capture elements were derived. 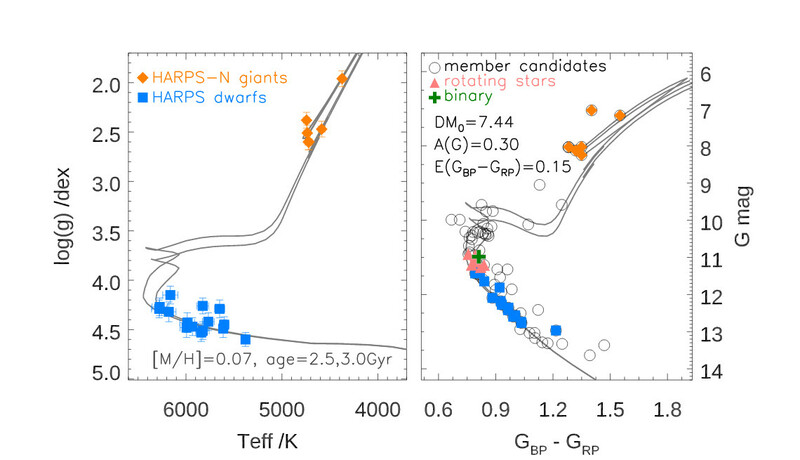 No evidence of significant differences between dwarfs and giants stars was found, with two exceptions: sodium is enhanced in giants with respect to MS stars, as expected from mixing mechanisms. Lithium shows a normal depletion pattern as a function of evolutionary phases; Li and Teff follow a tight relation for main sequence (MS) stars. Combining Gaia photometry with stellar models and other parameters obtained from the spectroscopic analysis, we could derive distance, Galactic coordinates, reddening, and age for Rup 147. In particular: metallicity Z=0.017 ([Fe/H] ≈ 0.08 dex); reddening of E(B-V)=0.113; age between 2.5 and 3 Gyr; distance ~ 308 pc from the Sun and 8.28 kpc from the Galactic centre; distance from the Galactic plane (below the Galactic plane) of 0.07 kpc. With the present work we added another object to the short list of clusters for which both giants and dwarfs are available. This constitutes an important test of consistency between the analysis of the different kinds of stars and of evolutionary processes affecting the surface abundances. Link to the paper: https://arxiv.org/pdf/1809.06868.pdf.